Another killer box from my farmer. Beets and onions went into the stock pile. Tomatoes, cilantro, jalapeno peppers and onion became fresh salsa which I put on beans, rice and topped with avocado. The blueberries I was so excited for! The last time blueberries were in the box I gave that box away because I was on vacation. They were delish! I’m always so sad when blueberry season ends, it’s a long wait until they are available again. 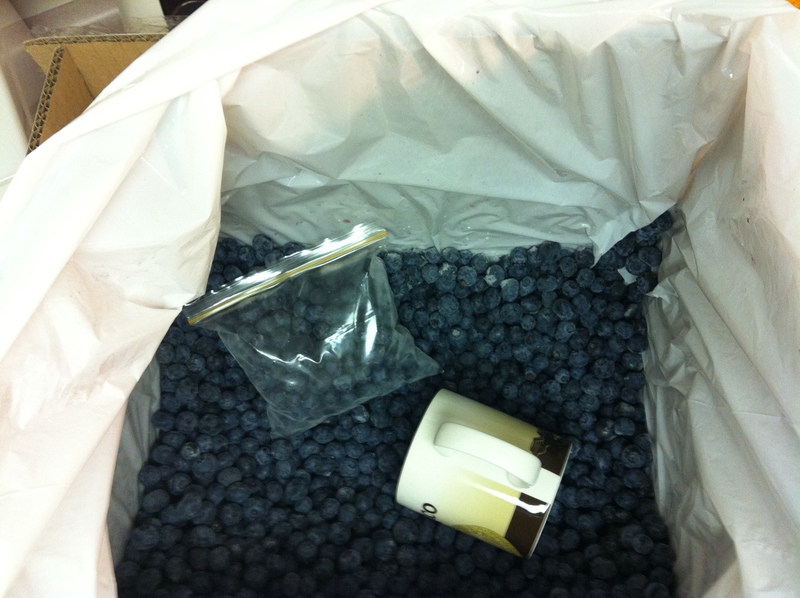 Luckily for me I bought 30 pounds of frozen blueberries to get me through the winter. 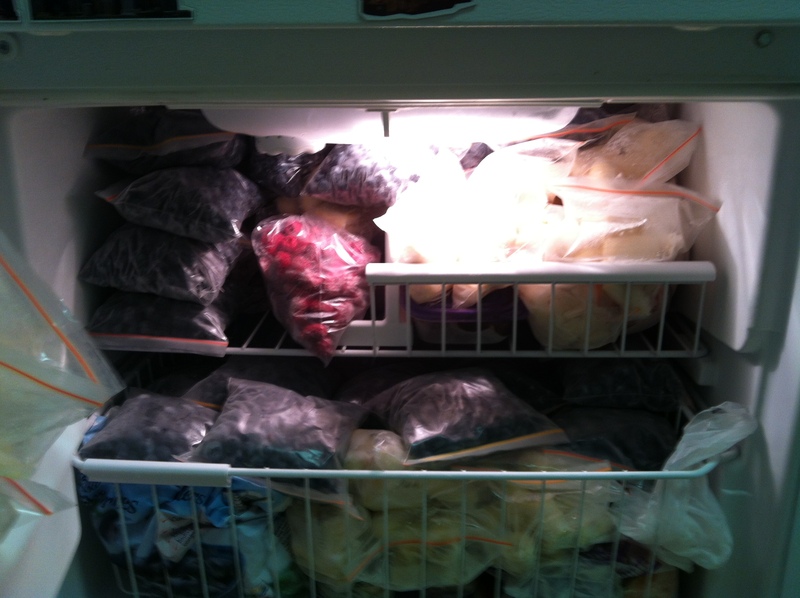 I had already stocked up on raspberries and bananas and wasn’t sure I could fit it all into my freezer at once. It wasn’t easy, but eventually it all fit. 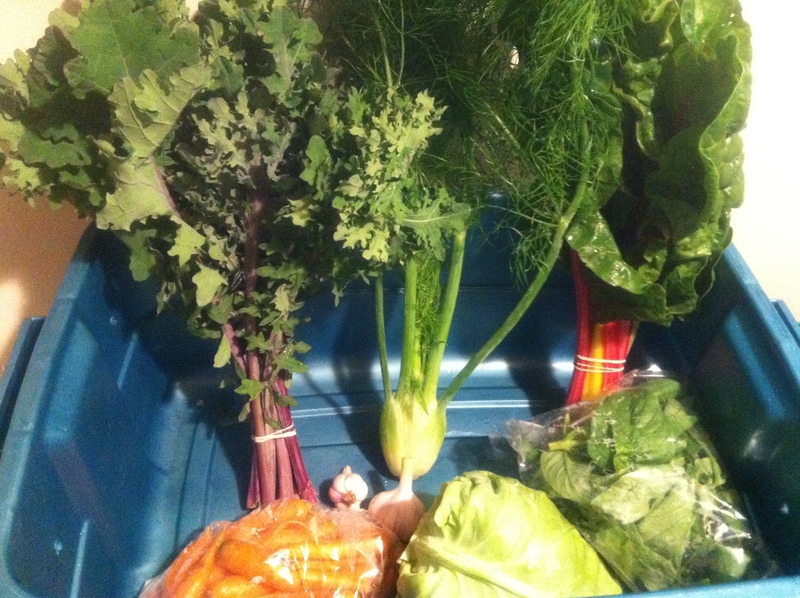 Back to the CSA box, butter lettuce was such a nice change from the endless red leaf lettuce. I made lettuce, tomato, sweet onion, avocado sandwiches with gluten free Portuguese buns from the farmers market. It’s been about 7 years since I’ve sandwich in a bun, gluten-free baked goods have come a long way. Next week I think I’ll buy some more. More carrots, some of these I juiced, the rest went into stir fries. Finally there was kale. I actually didn’t know what it was! I thought it might have been some sort of collard, but it’s flat leaf kale. It seems all I ever see in the stores is curly leaf kale, I figured that just how all kale was. I chucked it all into my morning smoothie. This is so well timed. 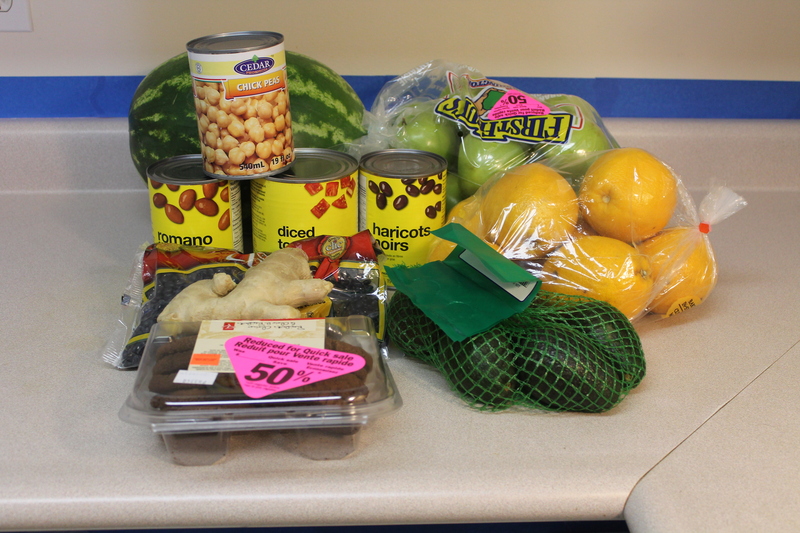 The month of September is Vegan Month of Food and Eco-Vegan Gal is doing a video series on how to be vegan on a budget. (edit: try as I might to only upload the first video in the series, YouTube keeps changing it to a playlist. 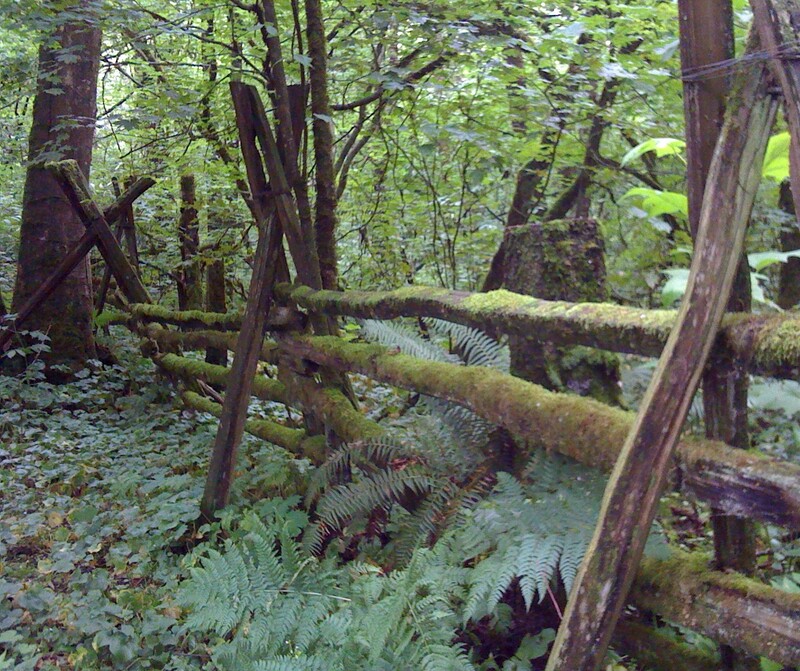 It is showing the most recent video uploaded in the series). Now let’s be honest, my food budget can be stupid, and it needs to be kept in check. How much do I spend on food a month? I have no idea, it could be $200 it could be $500 who the hell knows? I eat primarily vegan, mostly raw low fat, mostly organic and 100% gluten free. Essentially, I eat an expensive diet. I’ve been trying to earn more money, but it’s not really working. Maybe what I really need to do is spend less. Yay for the clearance section! I got the apples, oranges and cookies 50% off. I’m thinking of making a big pot of chilli and a ton of beans and rice. I also bought a bag of dried black beans, I have never made beans that weren’t crunchy, but I will figure it out. It’s so much cheaper to buy dried beans, plus they have less crap on them. Plus I have the CSA stockpile of potatoes, onions and beets to eat. 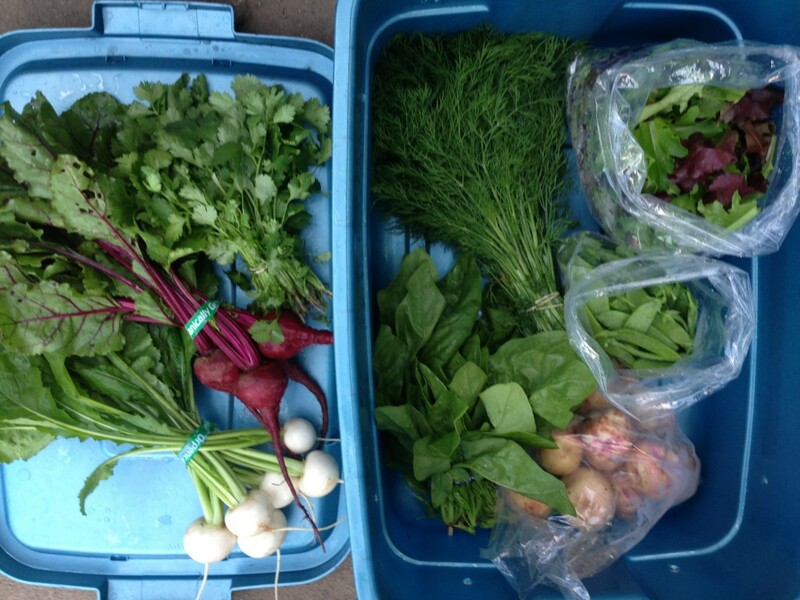 This week my farmer passed me my box and right away I commented how heavy it was! There are some definite highs and lows here. 1. Leeks. I seriously don’t know what I’m going to do with these. The last bunch I gave away to my dad and he hasn’t used those ones yet. He’s not super keen to take more. Suggestions needed. 2. Zucchini- I added these to the pile of zucchinis from the previous weeks and then realized I gotta start using them! I spiralized half of them into noodles and made massive salads and I juiced the balance. Wondering what I mean by spiralized? 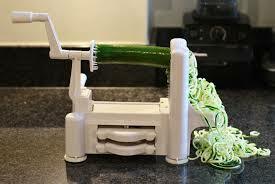 I spiralize cucumber, zucchini, and carrots into noodles and either treat them like past noodles or do a noddle salad. Change the texture of the vegetable and it’s like it’s something completely new and different. 3. Potatoes… added to the stockpile. 4. Gem squash – I haven’t used these, I’m waiting for the weather to cool and then I’ll bake them and then add them to a salad. I’m not the biggest squash fan, I fear this is the start of many more to come. 5. Corn- again I chowed this down so quickly. I brought the corn with me to work and was eating it at my 10am coffee break. My co-workers thought it was weird, but why wait until lunch, it was as sweet as fruit! 6. Beans. I polished off last week’s yellow beans in record time. I was at a berry farm on the weekend and saw that they were selling beans for dirt cheap. I didn’t anticipate that I would be getting more beans, so I bought a massive bag. Fast forward to mid way through week 12 and I am still trying to eat all these beans. I should probably have made pickled beans, and will probably regret it later. 7. Tomatoes- All of the tomatoes this year have been super ripe. I don’t know if this is how ripe they are supposed to be. Maybe the supermarkets have trained me to think that tomatoes should be kinda hard. Essentially they all needed to be eaten in a couple of days. I ate a lot of salads, and I ended up juicing some of them. 8. Swiss Chard – I actually ran out of swiss chard part way through the week for the first time ever. I found myself hunting in the fridge for something, anything green I could toss in my morning smoothie. I’ve actually had swiss chard in my garden all summer but haven’t touched it because my farmer has been giving me so much. Silly me I forgot all about it. 9. Eggplant. As a rule I don’t like it, it’s the slimy texture, I just can’t stand it. I’m sure I read an eggplant jerky made in the dehydrator somewhere, now I just gotta find it. 10. Poblano peppers- I probably should have used these to make salsa, but I didn’t have cilantro and I just knew it wouldn’t be the same. These peppers are still waiting for me. It’s been a busy August full of lots of fun things and some changes. I scheduled a lot of posts way in advance so I could take time to chillout and enjoy without thinking about what I was going to blog. Today I realized that a post should have hit the blog at 9am today, but I hadn’t written anything. Apologies lovely readers. 12 hours late I’m sitting in my garden while the hose is rejuvenating my veggie plants after a hot day. 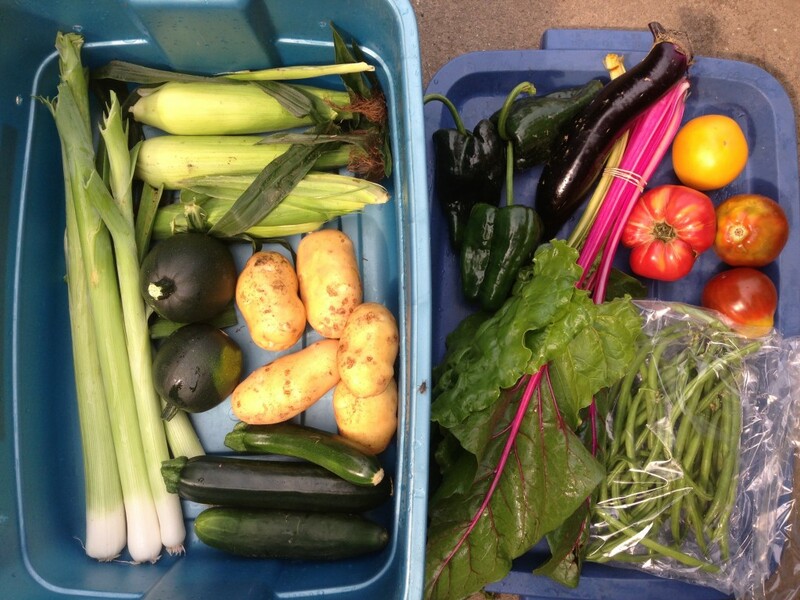 So week 10 of the CSA box was my absolute favorite. 1. Sweet onions- added to my collection of onions. I won’t be buying onions until the spring I think! 2. Cherry tomatoes- a rainbow of sweetness, red, yellow and purple. I pretty much ate them with everything, and they didn’t last long. Each colour had it’s own flavour and consistency. They yellow was softer and sweeter and the purple were more firm and less juicy. 3. Beets- also added to my crisper of veggies that keep well. I did toss some of the greens into my morning smoothie but I find they go limp so quickly that I often don’t use them fast enough. 4. Cucumbers and zucchinis- cucumber is one of my favorite things to add to juices. For some reason this week I just haven’t felt like juicing. I have pretty much used my juicer every single day for the last 4 years, so this is really unusual for me. Instead I’ve become obsessed with lemon and cucumber water steeped overnight in the fridge, it’s been the perfect summer drink this year. The zucchinis sat neglected in my fridge until week 11. 5. Carrots- also added to the stockpile and ignored until week 11. 6. Beans- oh man am I in love with beans this year. I’ve been eating them raw and adding them to everything imaginable. It’s amazing how often people see me eating them raw and comment that they didn’t know it was a possibility. Inevitably they grab a bean, taste it and comment that it tastes the same as cooked. I don’t know why that is a surprise to most people. 7. Cabbage- added to the fridge and ignored until week 12. Are you seeing a pattern here? 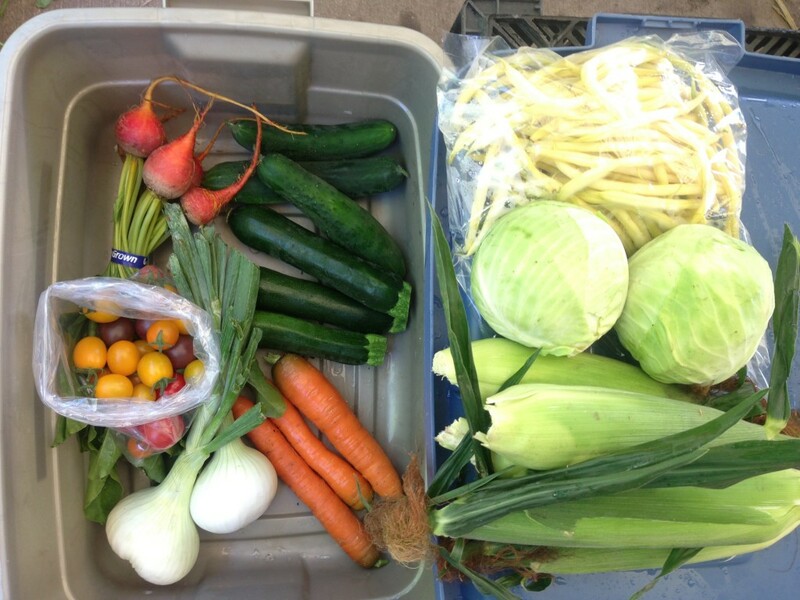 There was a tipping point when I thought I can’t possibly pick-up my CSA box today, my fridge is still full. 8. Corn!!! Oh my giddy aunt this corn was so freaking good. It was so sweet and best of all it is GMO-free. 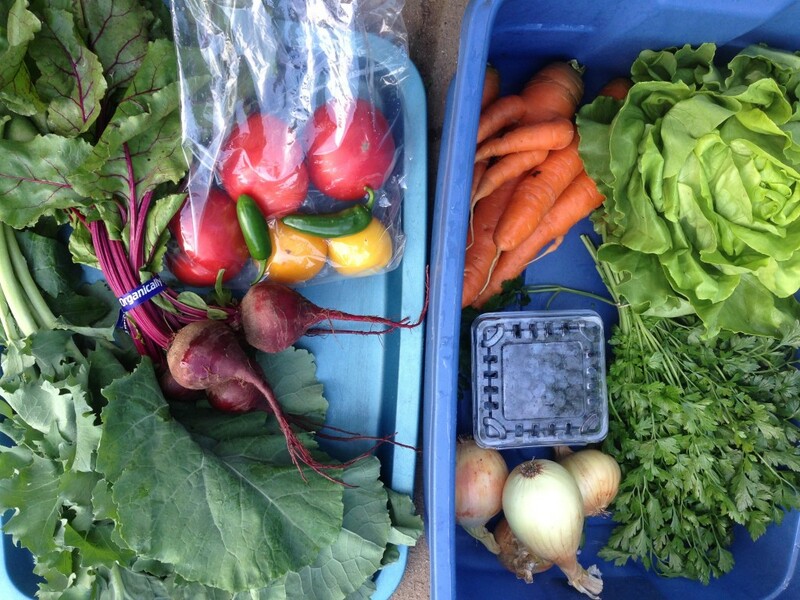 What did I do with CSA box week 8? As I was writing up the post for week 9 I was thinking I should tell you what I did with the last weeks box. Sometimes what I think I’m going to do is not at all what happens. I’m pretty sure I told you last week I was bringing this box with me camping. More red leaf lettuce. These heads of lettuce are so big, I made a salad for 6 adults and that only used up half of it. I also tossed in some basil from week 6, some cucumber, roasted garlic from week 6. Sadly the other half of the lettuce didn’t do well in the cooler and by the time the weekend was over it was time for the compost heap. I used the carrots and cucumbers in Vietnamese salad rolls, perfect for hot summery weather. I also tossed the cucumbers into a jug of water overnight with a couple slices of lemon. I’ve been drinking refreshing cucumber flavoured water at work all week. The leaks? Well I admit I had no idea what to do with them. Co-workers told me to boil them and top them with butter- gross. I ended up giving to my dad and he was thrilled. The plums. I ate one and my niece at one. My farmer said they were mealy and were best processed into jam or canned immediately. Since I was camping this wasn’t an option. These were not as tasty as the plums from my dad’s tree, very mealy. After a weekend in the cooler, they were pretty much smushed. They went into the compost heap. The potatoes and onion. I have a bit of a potato stockpile happening in my fridge, lucky for me they keep well. These weren’t used at all when camping, instead when I got home I made some hashbrowns with the onion and some celery. Beans. Wholly molley is that a lot of beans, good thing I really like beans. Before I left for camping I oven roasted a whole head of garlic (from the week 6 box) in olive oil. I then steamed the beans in a mix of roasted garlic, olive oil, salt and pepper- wrapped in tinfoil and placed on the BBQ. Everyone raved about them, and it was so delish I made it twice. I then polished off the rest of the beans at work yesterday by dipping them into hummus. ~ Boo for mixed greens. Mixed greens are not my favorite at all, nothing is worse than limp greens and after a day or two that’s what you’ve got. I gave them away. I had 1/2 a bag left over from last week, I fed those to my favorite horses. ~ Baby turnips have returned, I chop them up and toss them in salads, I think they would also be good in a salad roll. ~Potatoes galore this week. I don’t eat a lot of potatoes probably because my childhood was filled with them. Luckily for me they will keep a long time in the fridge. ~ Snow peas have been a tasty addition to salads and stir fries. ~ Zucchinis. I have come full circle when it comes to zucchinis. Growing up I hated them, then I only liked deep fried zucchini sticks, and then I hated it in all forms. These days I have learned to love them again. Turns out zucchinis are far tastier when raw, I still don’t care for the texture of cooked \zucchini. These will end up spiralized and added into salads. So glad that there aren’t anymore onions this week! I am still eating the lettuce from last week (plus I have some growing in my garden too) so I happily gave the bag of spring mix away. I will probably end up dehydrating most of the basil; it just doesn’t last very long once cut. I might try juicing the basil with some apples and cucumber, sounds like a good combination to me. Other than that I feel pretty confident that I’ll be able to eat the whole box in a week.